iPhone Apps - No Signal? In many situations like hiking, camping, skiing or after a natural disaster, you might find yourself in an area with no cell service. It may take hours for service to return. You don't have to keep checking your iPhone for service, you want to be NOTIFIED when you have service back! Step 1 – Just one click on this app. 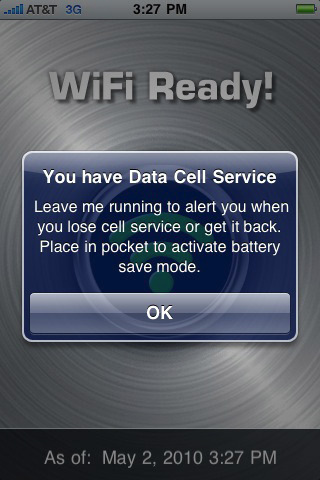 (It will monitor cell coverage, no need to keep checking for "no service" or "searching" indicator over and over. It can be dangerous to keep looking down at your iPhone while driving, or hiking in narrow trail!. Step 2 – Put the iPhone in your pocket, or face down in a car, letting the screen go off. Just wait for the Alert/Vibration alarm, then attempt to text or call. The Proximity Sensor is enabled. It uses very little battery power when in this mode, this could turn out to be a Life Saver! This app is great for traveling in a car between coverage areas. You can wait for a cell while listening to music on your iPhone, just start up your music then launch this app. It will monitor in the background, when service returned, it will alert you. You can set your volume level to control how loud the alert is, or use mute if you want a vibrate alert only. Or use the app to alert you when you ENTER an area of no data service (it will work in both situations). 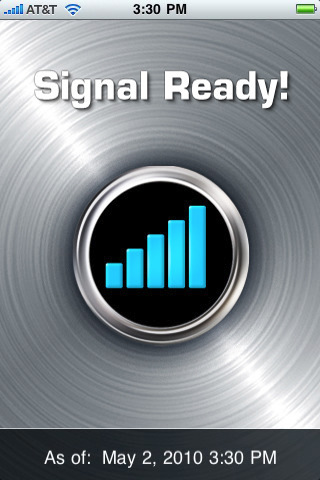 IMPORTANT: This app is primarily meant for the iPhone, it is used to detect cellular network capability. An iTouch/iPad do not have cellular radios, thus, although this app will run on the iTouch/iPad, it will be limited to informing you of WiFi status only. For the iPad 3G this app will monitor 3G availability.